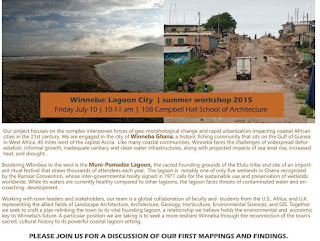 Charlottesville-Winneba Foundation: UVa School of Architecture Presentation -- "Winneba: Lagoon City"
UVa School of Architecture Presentation -- "Winneba: Lagoon City"
Over the past year, Prof. Nancy Takahashi of the UVa School of Architecture, along with several other colleagues from Ghana, the U.S. and the U.K., has been working on an interdisciplinary environmental protection/sustainable development project in Charlottesville's Sister City of Winneba, Ghana. This Friday, July 10, the group will present a project overview and discuss their initial findings. Open to the public.